Earned at least 4 Conformation, Performance or Companion event titles on dogs they bred. Certifies that applicable health screens are performed on the sire and dam as xxrecommended by the Parent Club. Demonstrates a commitment to ensuring 100% of the puppies produced are AKC xxregistered enabling AKC to maintain accurate records. The American Kennel Club states, "The Breeder of Merit Program honors breeder/exhibitors' dedication and hard work as they continue to produce dogs that are healthy, capable, and beautiful. The foundation of today's AKC, Breeders of Merit have the power to influence, guide, and teach future breeders, exhibitors, and all purebred dog owners." John Lyons, Chief Operating Officer of the AKC notes, "Our Breeders of Merit are committed to both improving their breed through health testing and selective breeding programs, and proving their breed through achievements in the show ring. They are special and will be emulated by new breeders entering the sport. Being a successful breeder in the Fancy does not come easy. Years of hard work, vision, and a willingness to do the right thing are required to be successful. Our Breeders of Merit have these qualities and deserve to be recognized." in order to assure optimum health. The American College of Veterinary Ophthalmologists. that all tests have been performed and results registered. 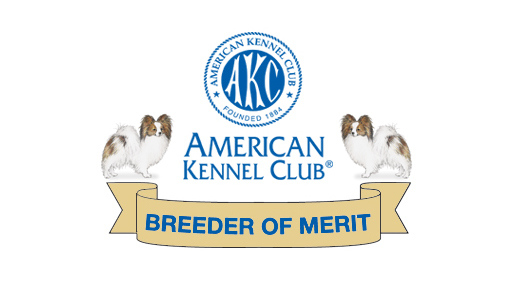 CHIC number fulfills partial requirements for designation as an American Kenel Club Breeder of Merit.